National Racketball Doubles deemed a huge success!! Thame Racquets and Fitness club played host to the annual National Racketball Doubles Championship on October 10/11th, with a much improved entry on previous years which saw a total of 25 pairs in attendance. There were three separate events which included Mens, Ladies and Mixed categories all of which saw some fantastic matches. In the Ladies event the formidable pair of Lucy Murphy and former WISPA professional Stephanie Brind secured the title beating Karen Bealey and Kathryn Milne 3-0. In the mixed event there were some really tough matches which saw defending champions Jim Lord and Julie Lawton narrowly lose out to Andy Murphy and Stephanie Brind (3-2) who went on to take the title. The Mens event saw a strong competitive draw consisting of thirty two players and including main and plate events. After some scintillating matches the plate event was one by Mark Webster and Surbiton based Rob Lelliot. The main event witnessed some top quality performances which eventually saw top seeds Jim Lord and Matt Baker overcome some tough opposition to seal the title. The pair won four hard fought matches including a tough five set quarter final against Mike Henning and Mark Baynes from Surbiton. In the final both players were in fine form beating former England Number seven Steve Bateman and Andy Scott 3-0. National Title for Baker and Lord! 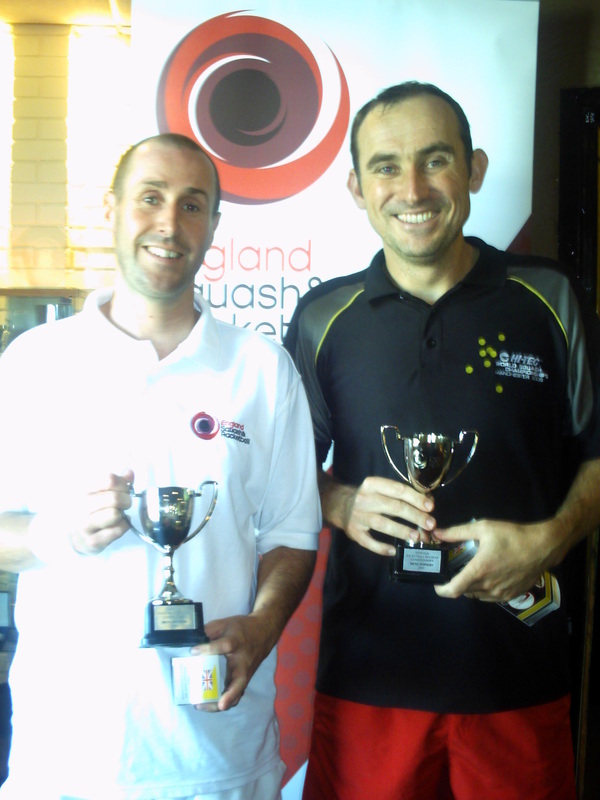 ESR duo Matt Baker and Jim Lord are the new National Racketball Doubles Champions. The pair won four hard fought matches including a tough five set quarter final against Mike Henning and Mark Baynes from Surbiton. In the final both players were in fine form to beat former England Number seven Steve Bateman and Andy Scott 3-0.